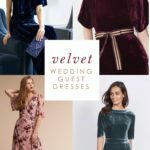 Wedding style trend alert! Since late last fall, and perhaps even before, dark floral prints have been making their way onto the chicest boutiques and best-dressed ladies everywhere. 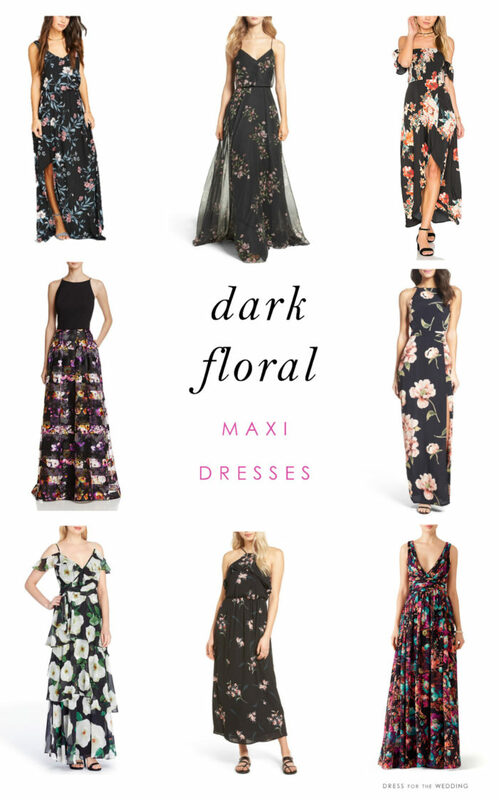 We’re going to look at some of the prettiest styles of black floral dresses for weddings! Dark floral dresses are a natural choice for fall, and the trend really started hitting stores in full-force then. 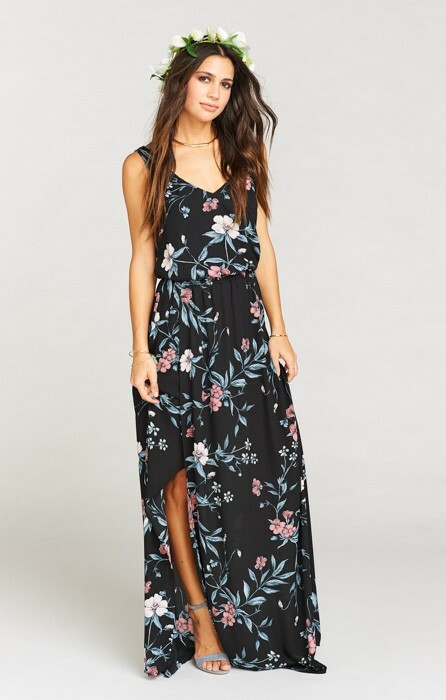 But even with the advent of spring, these darker floral maxi dresses haven’t totally given way to pastel prints, in fact we’re still seeing a lot of florals set on black or navy blue backgrounds for spring and summer. When you think about it, this style is ideal for weddings, because they a cheery way to wear a black or navy blue dress, in a floral print that is almost always upbeat. 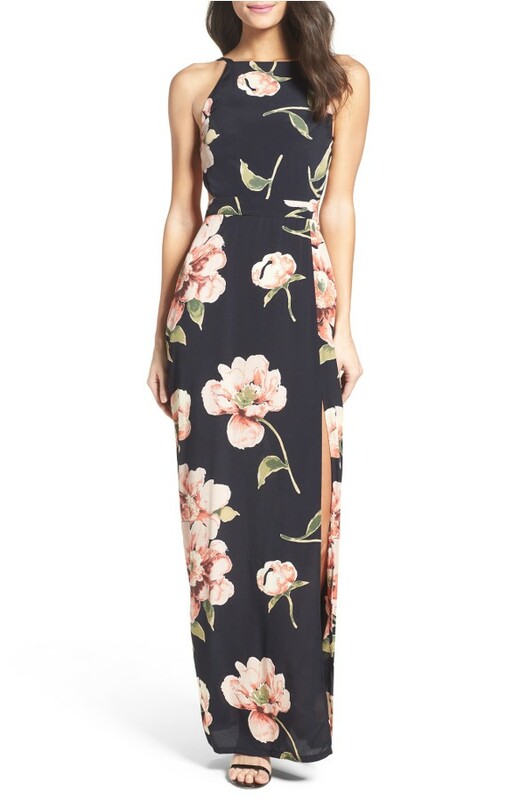 We showed a short black floral dress a few years ago, and this navy cold shoulder maxi. 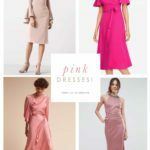 Here are a few more dresses in this trend that we think are great for guests, and some that are perfect for a mix and match look in a bridal party! 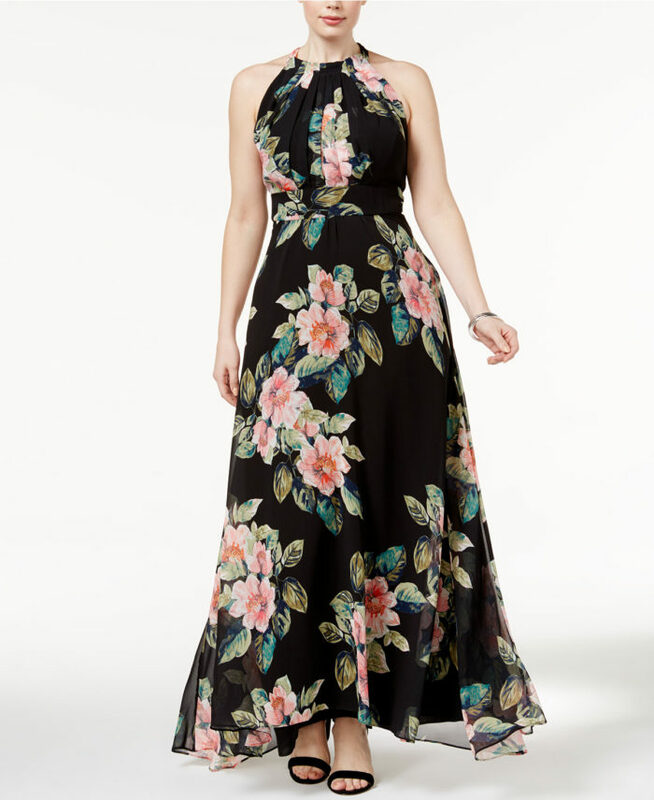 International Concepts Maxi Dress from Macy’s would make a gorgeous choice for any spring wedding, it would also be a beautiful choice for a mother-of-the-bride dress for a outdoor casual wedding. 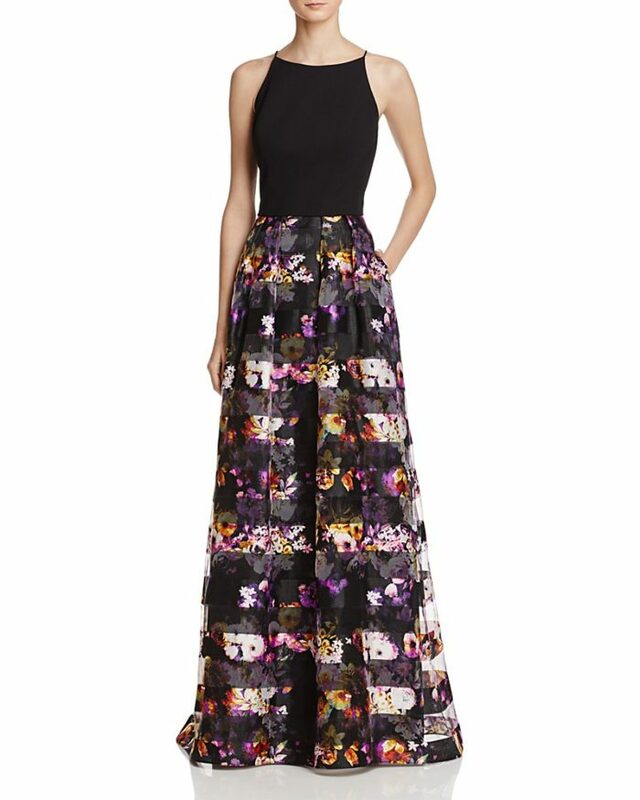 Floral Jacquard Gown by Avery G from Bloomingdale’s. This richly textured navy and blush high-neck formal style is ideal for a spring formal or black tie wedding. 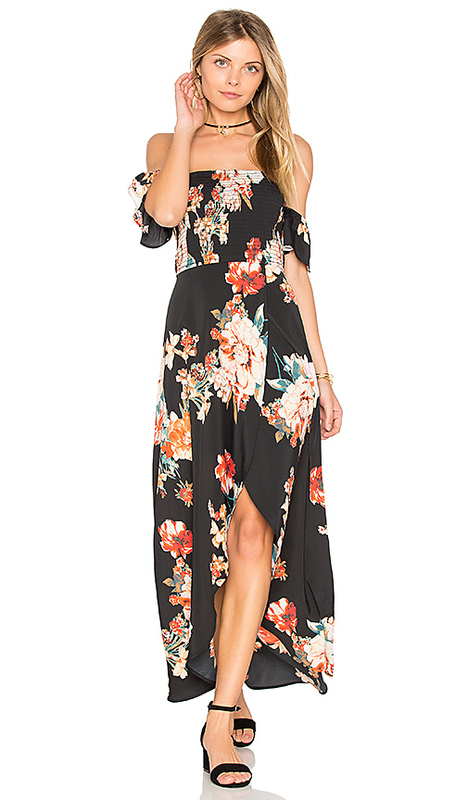 Give Me Amore Black and Pink Floral Print Maxi Dress from Lulus offers a stunning off-the-shoulder style. A truly romantic dress for spring weddings. Sleeveless Wrap Gown from DVF from Saks Fifth Avenue. An elegant formal length and eye-catching print, make this a great pick for everything from a semi-formal wedding to black tie reception. Wondrous Water Lilies Black Floral Print Maxi Dress Sleeve-seekers, take note! This all-season style is a wonderful high-style choice for early-spring, to give a little added coverage (and warmth!) for those chilly wedding weekends! 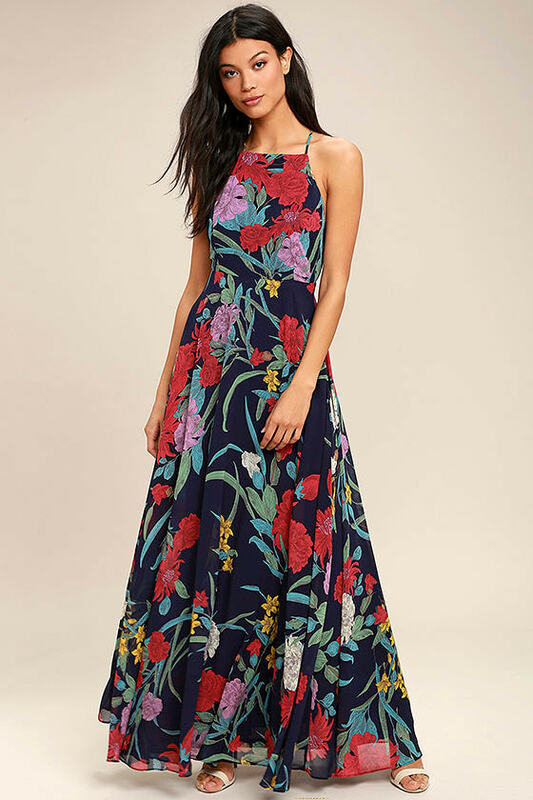 Large Floral Maxi from Band of Gypsies A beautiful bold boho-print with off-the-shoulder top for beach weddings or outdoor wedding receptions. 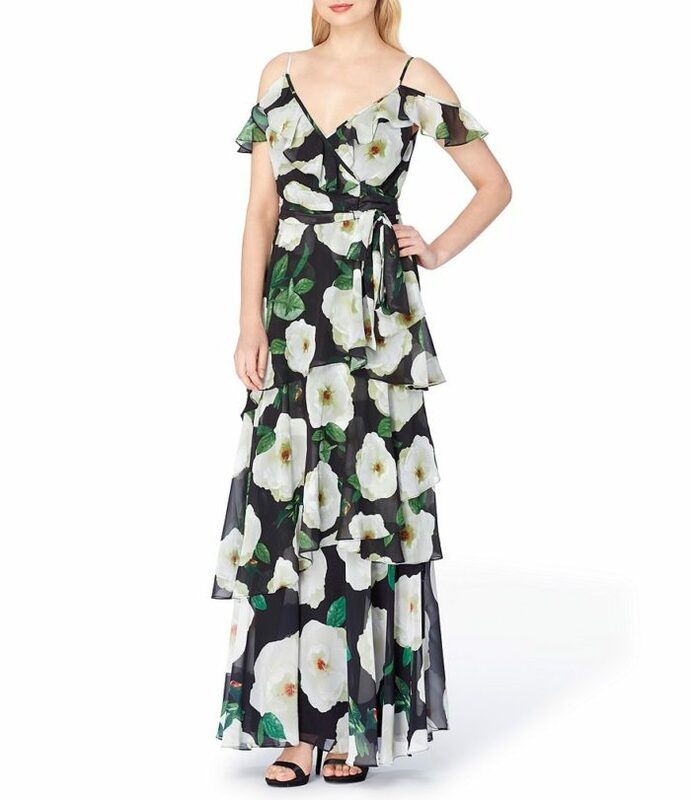 ‘Kat’ Dress by Yumi Kim from Shopbop A striking print and flattering wrap style make this a gown that can go to nearly any wedding in style! 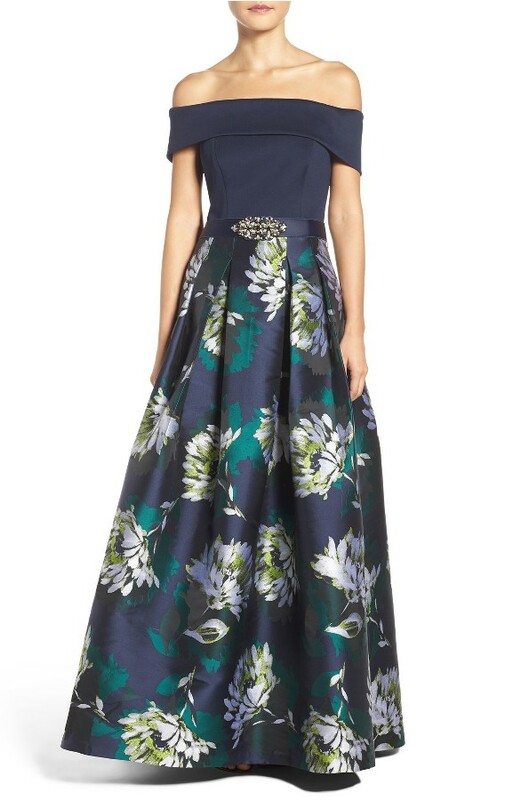 Off-the-Shoulder Ball Gown in Navy Blue by Eliza J from Nordstrom This formal off-the-shoulder style is done in an eye-catching combo of navy, green, and yellow. 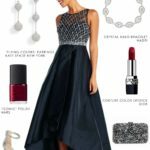 This ballgown would be ideal for black tie events or for a supremely stylish Mother-of-the-Bride gown for spring, summer, or fall. 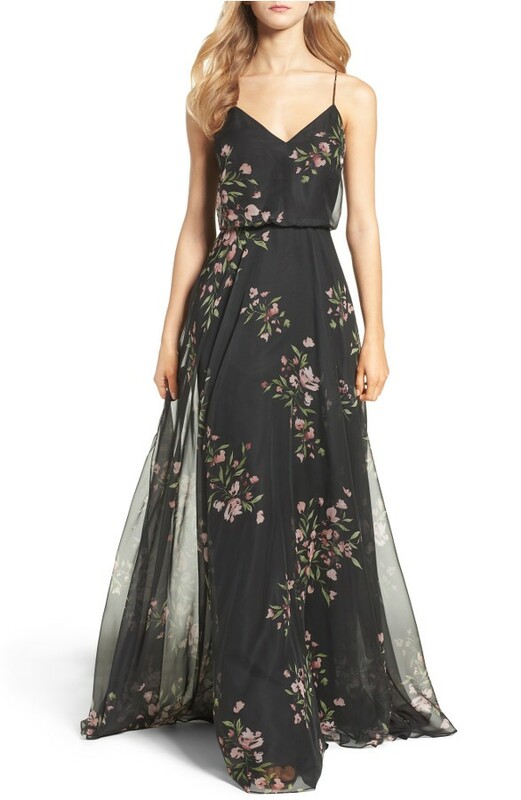 Tahari ASL Floral Gown from Dillards Pretty tiers and just the right amount of shoulder. This dress would be at home at a rustic wedding, a winery wedding, or any outdoor wedding reception. 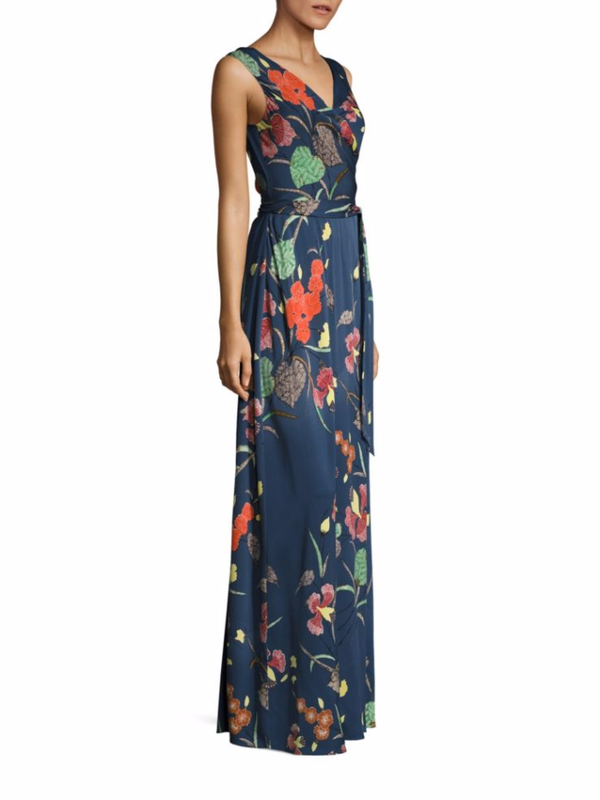 Badgley Mischka Dark Floral Gown from Rent the Runway This designer gown can be rented for a fraction of the retail cost, and this bold, bright print is perfect for semi-formal and formal invitations! 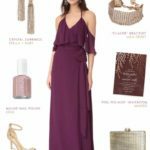 ‘Inesse’ Dress in Black and Cinnamon Rose by Jenny Yoo from Nordstrom This dynamic style is a gorgeous wedding guest dress, but also is made to pair with Jenny Yoo’s line up of stunning bridesmaid dresses. Mix this with blush, cinnamon, or solid black dresses for a beautiful wedding party style. 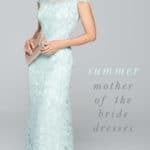 Kendall Maxi Dress in Wedding Soiree from Show Me Your Mumu Another bridesmaid pick that would be lovely for a tropical destination wedding or beach wedding, or as a summer wedding guest style. 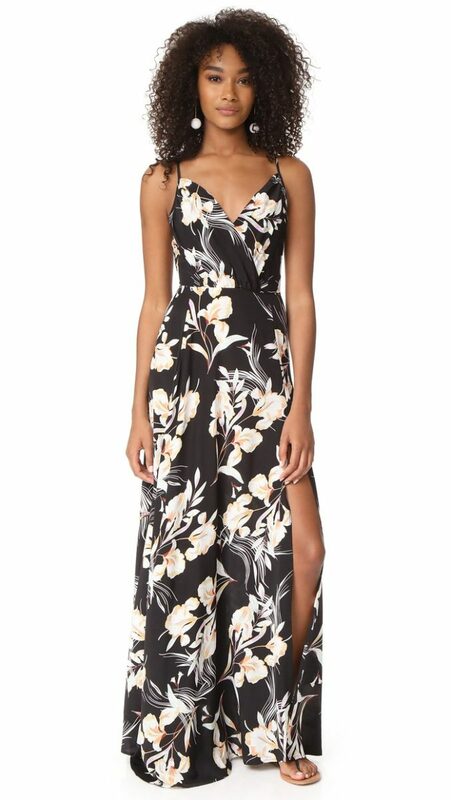 Lush Ruffled Maxi Dress from Nordstrom (Only $55!) 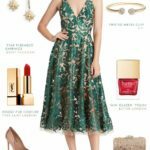 Dress this one up with a pair of heels and some statement earrings and a clutch to wear as a guest of a outdoor wedding or rustic wedding. 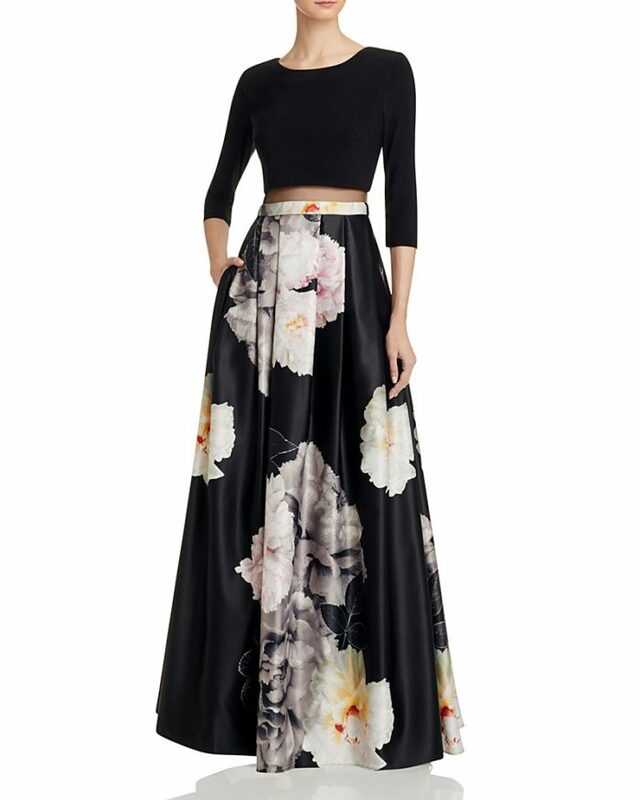 Two-Piece Floral Formal Gown by Aqua from Bloomingdale’s. These chic separates are a great style for a modern formal wedding. 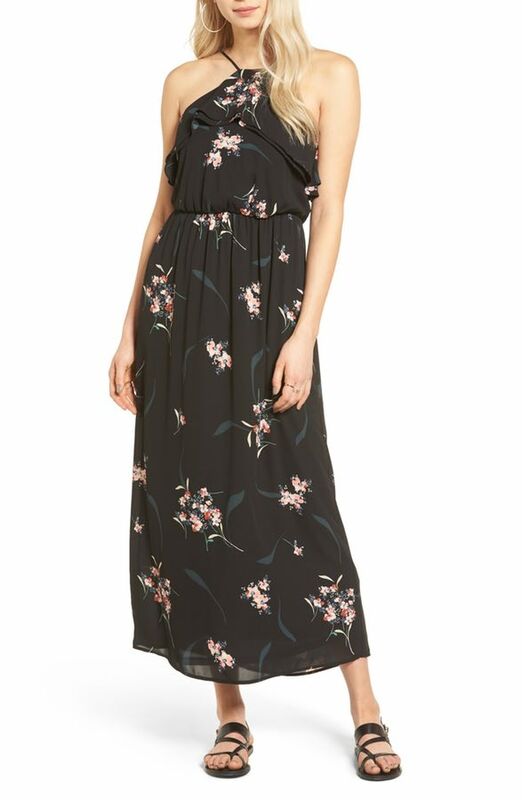 Legendary Romance Black Floral Print Wrap Maxi Dress Sweet and romantic style for a guest of a rustic or garden wedding. 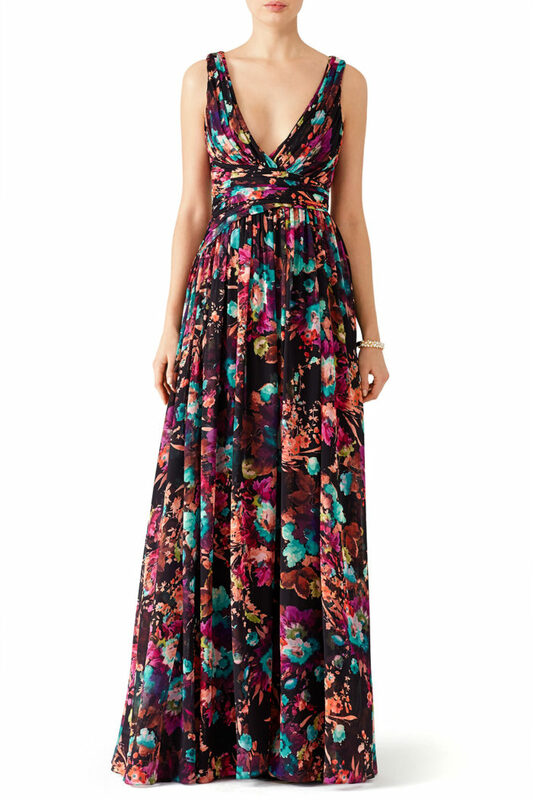 Tulip Time Strapless Floral Maxi Dress from Nordstrom A pretty little strapless style with plenty of flower power for semi-formal cocktail wedding and reception attire. 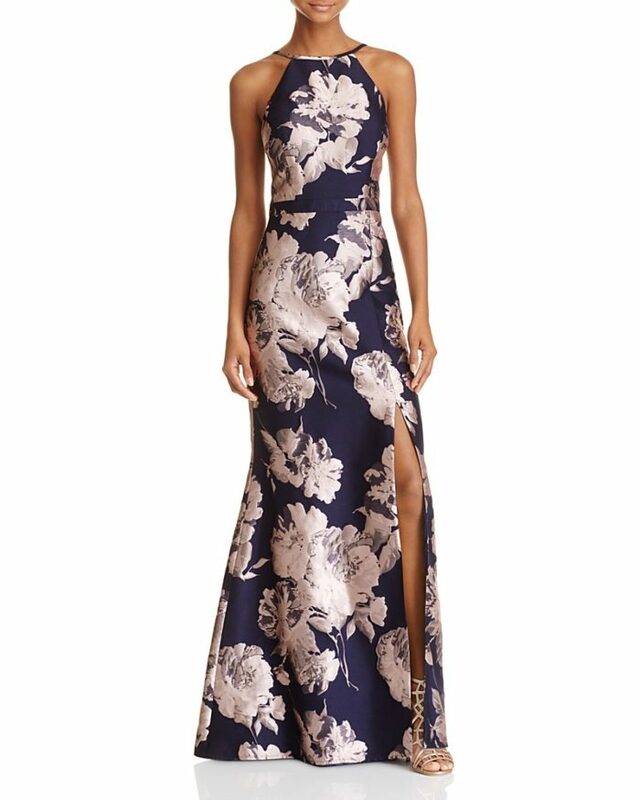 A Dream Realized Navy Blue Floral Print Maxi Dress. A beautiful high neck flowing gown for daytime wedding or afternoon wedding. 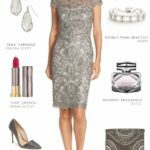 Dylan Gray Illusion Waist Gown from Bloomingdale’s Elegant sleeved style for a formal evening wedding! 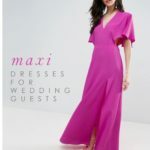 Roe and May Lido Crepe Long Dress from Nordstrom a chic and versatile style that can be worn to an afternoon wedding to more formal evening wedding events. 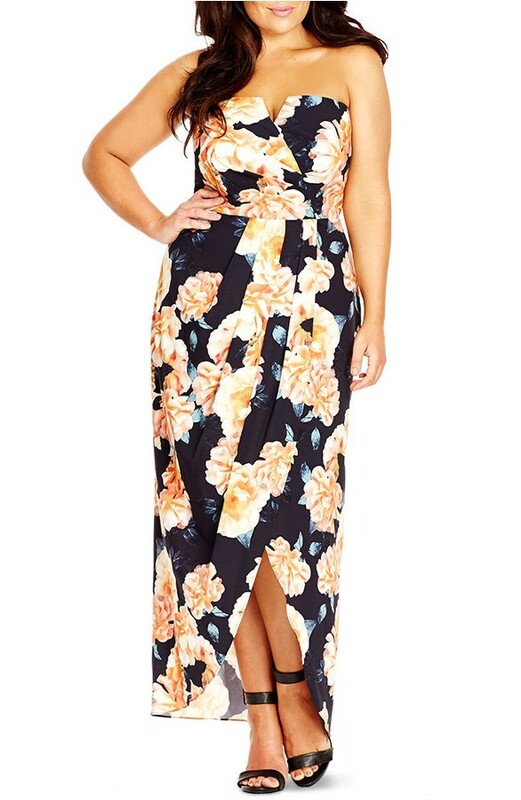 our recent style idea for how to accessorize a floral print cold shoulder maxi dress!